Laminate flooring is popular throughout homes and the best choice for many reasons: it’s durable, significantly less expensive than hardwood and even carpet, and easy to install. 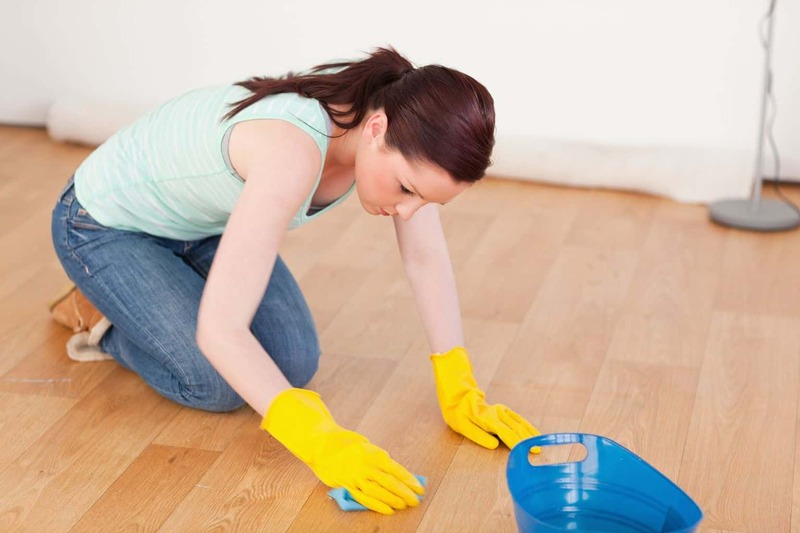 Laminate floors are easy to clean, if you do it correctly! It is important that you use the correct laminate floor mops on your floors, however, as using the wrong method of cleaning your laminate floors can void the warranty or worse, ruin your laminate floors. The most important thing to know when mopping your laminate floors is that soaking your floors can cause warping. In this article, we will give you the low down on several different kinds of laminate floor mops so you can perfect your cleaning routine and keep your laminate floors clean and gorgeous! 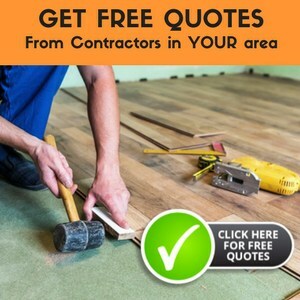 What Type of Mop Is Best For Your Laminate Flooring? A steam mop is a more expensive mop option, but a favorite among many for good, deep cleaning, especially in areas like the kitchen where many spills happen. Steam mops are praised for how easy they make cleaning. The warm steam action helps remove stains, spills, sticky messes, and even helps kill bacteria in hardwood floors. If you have pets or children who spend time on the floors, these benefits may have you convinced to run out and purchase the most top of the line steam mop you can find, but it is important to note that steam mops are almost always not recommended for laminate by laminate flooring manufacturers. A traditional style spin mop can be used on your laminate floors. If you’re wet mopping your floor, you will want to use a spin mop rather than a sponge mop. 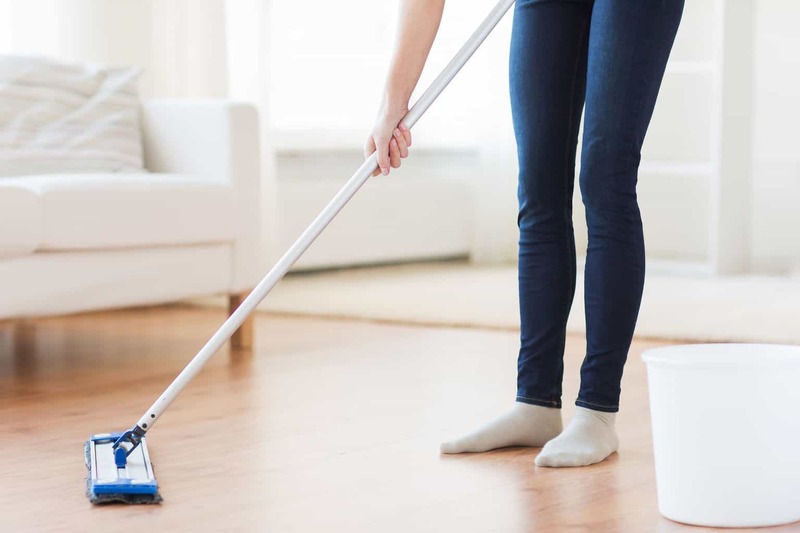 A spin mop will spin out the additional water and/or cleaning solution, unlike the sponge mop which holds on to a moisture, so you don’t leave your laminate floors sopping wet. Spray mops have a built in canister to hold and spray a cleaning solution as you mop. The positive of this is that it uses less of the cleaner or wet solution than a spin mop, but also usually comes with a microfiber cleaning head. 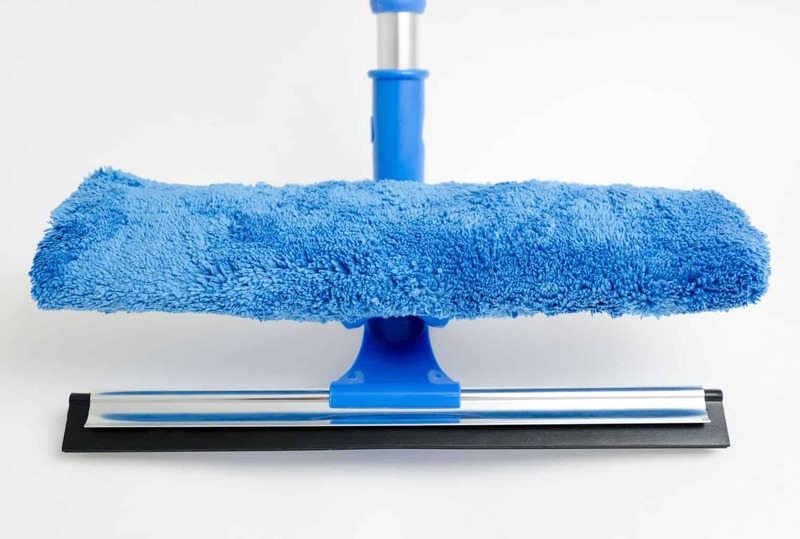 Be cautious when selecting your spray mop that it has a fairly gentle cleaning cloth (such as the microfiber) and any scrubbers are designed so that they can be used on a single, sticky mess, but aren’t scrubbing the entirety of your laminate floors, as this much abrasion can be damaging. The negative of a spray mop is that you are limited to using only the specific brand of cleaning solution designed to fit in the spray canister built in to the mop itself. The best multi-purpose laminate floor mop solution is a dry mop. A dry mop is exactly what it sounds like: a laminate floor mop that uses almost no water. This is what makes it ideal for laminate floors. Dry mops have a reusable microfiber cloth that attracts dust, fur, and dirt. A dry mop combines sweeping and mopping in that it can be used without any cleaner to collect and pick up the dust, dirt and hair, but does not scrub or dissolve stains, spills or grime. However, you can spray a cleaning solution or use a very light amount of soapy water on any messes and this combined with the scrubbing of the microfiber cloth will result in a good, gentle cleaning of your floors. After using the dry mop, you simply rinse and ring out the microfiber cloth and allow to dry for the next time. They can also be washed and dried in your machine. You can also find dry mops that use a disposable cloth with grooves to trap the dirt which are then just discarded after use. There are also disposable “wet” cloths that come presoaked with a cleaning solution which can be used for a deeper cleaning. Microfiber cloths pick up dog hair and dirt particles, so you don’t have to sweep first. These are the very best for daily cleaning of your laminate floors. While disposable dry and wet mop heads do a good job at accomplishing daily cleaning, they do not offer the gentle scrubbing microfiber cloths are good at. A reusable microfiber cloth is also more economically and ecologically friendly, as they are reused and produce less waste, and can be reused over and over again. The convenience of disposable dry and pre-moistened mop heads is a definite positive; though the upkeep of a reusable microfiber mop head is minimal, disposable pre-moistened mop heads also eliminate the need for any additional cleaning solutions. When choosing a cleaning solution, you will want to find something that won’t leave behind any sticky residue. An all-natural vinegar solution in a spray bottle is an easy, economical cleaner for laminate floors. While vinegar is too abrasive to use straight, vinegar naturally has antibacterial properties and, if diluted, makes a great cleaner for laminate floors. Use 1 part vinegar to 4 parts water in a spray bottle, and consider adding a few drops of an essential oil (eucalyptus and peppermint happen to be my favorites, and have the added benefit of being a deterrent to insects) if you don’t like the strong vinegar/pickle scent. There are also countless store bought and brand name spray cleaner options. When selecting a store bought cleaner, look for something gentle or all-natural, especially if you have pets or children who spend a lot of time on your laminate floors. You will also want to check the manufacturers’ recommendations on any cleaners to avoid on your laminate floors. Another cleaning solution you may consider is few tablespoons of a mild soap like baby wash or dish soap diluted in warm water. 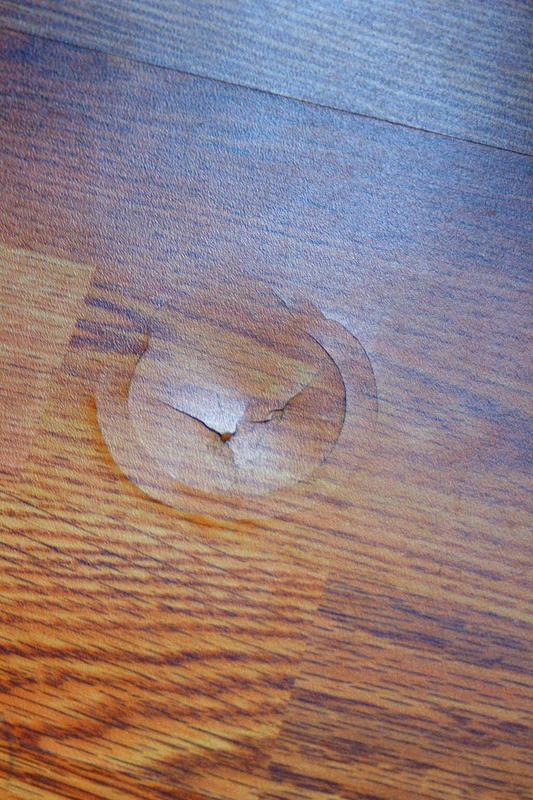 You will not want to use water that is too hot and you should avoid soaking your laminate floors, as this can cause damage and warping. Finally, when choosing your laminate floor mops, keep in mind the physical design of the mop. 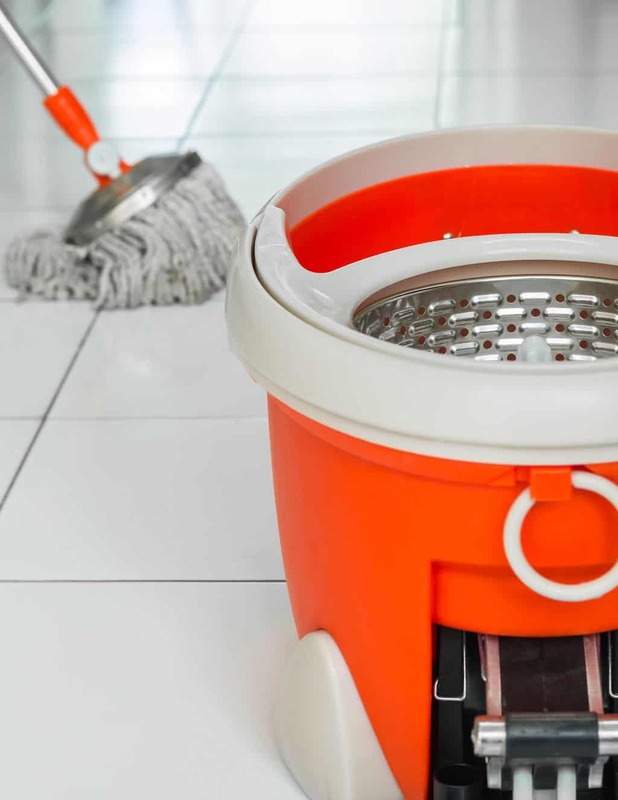 A wider mop head equals larger coverage when mopping and gets the job done quicker, while a more narrow mop head provides greater maneuverability around and between chairs, tables, corners, etc. Also, consider selecting a mop with a swivel head for additional maneuverability.